Coney desperately needs clothing stores. My wife says they are very good. I see them all over the place. Good job Joe! Coney should have clothing stores on the shopping strip along Mermaid Ave, there are quite a few clothing stores there already. The amusement district should be amusements. Games, Entertainment, Rides, and the like. There was a Rainbow in the Trump Village shopping center for decades till they closed how many years ago. It doesn’t fit in the amusement zone, No matter what Joe wants. 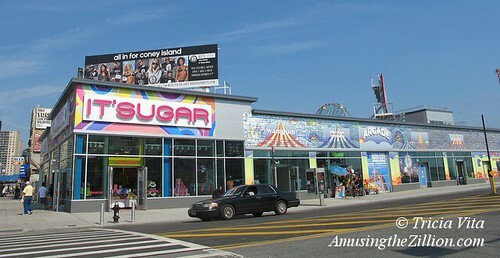 Coney should never be considered a retail zone, but a amusement zone. 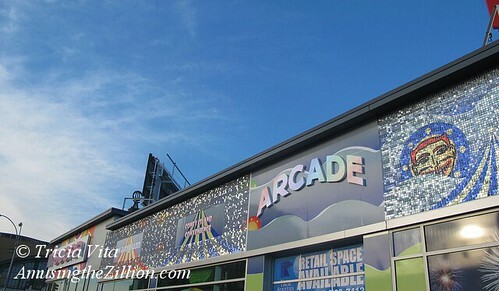 .The simple fact is, retail stores can generate much more income from sales, then an arcade or game operations can. Patrons in retail operations are only limited to spending based upon their credit card limits, and easily swipe hundreds of dollars on a single transaction…. Games of any kind, are limited to pocket change and/or expendable cash, and generally patronage is not driven by the desire to dress oneself up in some new “look at me” fashion. Game operations MUST be operated under an entertainment budget of the larger complex, in order to be successful. Games provide an atmosphere, and a reason to come to the area complex…. they are the draw, and should be used as an anchor for development. Professional game operators can tailor the operations to fit such needs. You simply cannot expect to lease out retail space and expect a games operation to be able to pay the bills, unless the operation is one that targets scamming games that will seek to take advantage of patrons in effort to grab big money, and give little or no return. Games should be selling fun and entertainment. This is a way of operation that was once found in the Amusement Business, but sadly, is all but lost today. As today’s economic demands press down on operations, entertainment operations can easily be forced upon making money rather then providing fun; it becomes a matter of survival. It is all about zoning laws. Without it, all of New York would be condos and Wal Marts, or whomever can pay the most per square foot in rent. The city in knowing what makes the Coney Island amusement unique, want to keep it that way. Even though Joe Sitt would make 100’s of millions in profit if he could sell his land as residential zoning, the city is saying no. Does a arcade establishment like Fabers enhance Coney Island, yes. Can they afford to lease out space in a overpriced space in Sitt’s building, no, does that mean they cant exist anymore? no. Rainbow – terrific. Cheap, tacky, sweatshop crap. What a great addition to the Island. who the hell is going to ride all the way down to coney island to buy shoes? Want to go back to the 80s? That was the absolute low of Coney Island. Bombed-out, graffiti-laden, rat-infested structures. See the movie “Warriors” (1979) to see what CI looked like then. The boardwalk was empty at the height of summer. Nobody came to CI – it was too scary. But let’s keep the “chains” out at all costs. We need a return to those glorious 80s. I suspect people with such opinions never stepped foot in CI in the 80s. None of you lived here, that’s for sure. But I have an idea. Lets build a Coney Island of the 80s in YOUR neighborhood , complete with the filth and graffiti. Lets hear your opinion then. yeah I was around in the 80’s, went to coney every summer and warriors was just a movie you dope. It’s funny how people who where not around back then try to describe NYC because they saw it in the movies. It is not a question of chains vs mom and pop retail stores, but what type of retail stores belong in the amusement park zone. Here is a excerpt from the CIDC in what they want to see. Retail and service uses complementary to amusement uses and beach activities such as arts and crafts production and sales, bicycle sales and repair, gift shops, and beach furniture stores. These uses would be limited in size and frontage. I do not see women’s clothing store listed, does anyone? As far as the Warriors are concerned. Watch the movie, you see the gang walking down the Bowery only. You cant tell from that one scene what the whole neighborhood looked like. You see rides on the south side of the Bowery. I will admit during the filming, on the north side of the Bowery, between West 12 and Jones Walk, you do see one building in less then good condition, but that building still survives today, except for a portion on West 12 which was fire damaged beyond repair just a couple of years ago. I lived here all my life. To say the Boardwalk was empty in the summer is to simply lie about the past. It wasn’t. U are just wrong. U are forgetting what CI in the 80s was. We used to talk about how empty the beaches were. You could walk right up to a cashier at Nathan’s in the height of summer. You people want to twist facts for your own personal political agendas, I can’t stop you. Fact is, CI now is enjoying a popularity not seen since the 60s, and “chains” help in this revival. The only chain store that was open prior to Applebees was Popeye’s, and until last year, even they were absent from Coney Island. So your saying from 1980 till this year, you could walk right up to a register at Nathans in the summer? Anyone who ever waited on a 20 minute line for decades at Nathans would wish you were correct. Thanks everyone for your comments! Just a FYI…the main point of this post is simply that Thor Equities was required to have amusements–a mere 15% frontage–on Stillwell in order to obtain a Certificate of Occupancy for the new retail building. Then he has to hire someone to open/close the place, give out change, pay for electricity, etc… Like this he sneaks in his every place retail that goes against the spirit of the zoning laws. The furniture store zoning issues have been on CB13’s radar for years, sadly, unsuccessful. But with Sitt’s plain jane womens retail store opening up, breaking the spirit of the zoning laws doesn’t help.